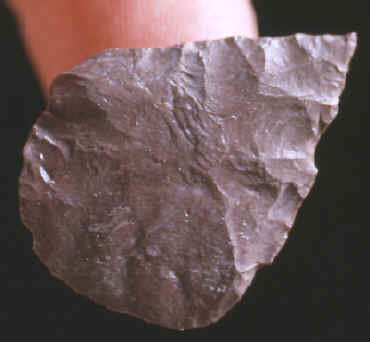 This is a cast of a Chindadn point that was found during excavation of the Moose creek site in 1996 by Georges A. Pearson (University of Kansas). It was found 6 inches (15cm) below the lowest part of the site's microblade component near a hearth that was carbon dated at 11,190 plus or minus 60 years before present. This small thin projectile point was made on a flake. It measures 1 5/16 inches (3.3cm) long. The Moose Creek site was discovered in 1978 by J.F. Hoffecker and C.R. Waythomas during the north Alaska Range Early Man Project. The site was re-excavated in 1996 by Georges A. Pearson (University of Kansas). Moose Creek is a Late Pleistocene-Early Holocene multi-component site that contains a Nenana complex occupation overlaid by two superimposed Denali complex components. Among the diagnostic Nenana complex tools unearthed during the 1996 re-excavation were a large scraper plane, a sub-triangular point and a tear-drop shaped Chindadn point. An AMS date from a hearth dates this Nenana complex occupation at 11,190 plus or minus 60 years before present. 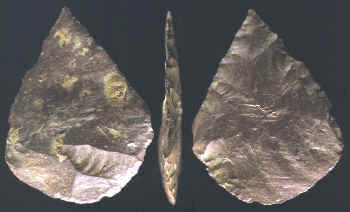 The Nenana complex of Alaska lacks microblades and is interpreted to represent a precursor to Clovis. Nenana complex points also show technological affinities with Streletskayan projectiles from Upper Paleolithic sites in European Russia. Other Nenana complex sites in the Nenana Valley include Dry Creek and Walker Road.